I love Small Town America. I love that my little town has people who volunteer their time to commemorate national holidays. 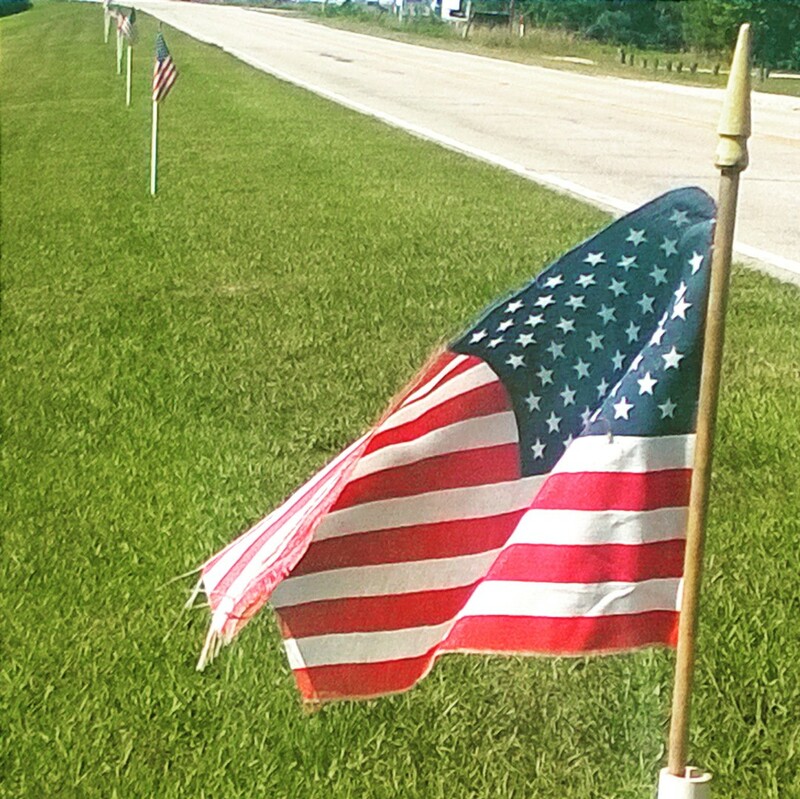 Without fail about a week before Memorial Day, Independence Day and Veteran’s Day, flags appear along a three mile stretch leading to the back gate of Camp Lejeune Marine Corp Base – all to honor those that serve/have served. Living next to a military base has it’s challenges what with the shelling, guns blasting, helicopters flying… It can get quite noisy. And then there’s the convoys which seem to happen when you’re running late for an appointment. The slow moving traffic can cause a saint to swear. It’s a small price to pay for the freedom we enjoy. My family has been fortunate. Our servicemen have all come home. We don’t take that lightly. So today, as we celebrate another safe homecoming, we will remember those who weren’t so lucky – those who made the ultimate sacrifice and we will pray for comfort and peace for their families and friends. Container gardening has its advantages – like no weeding. I’m loving that! The plants are growing – actually looking better than I had hoped. If nothing else, I’ll have tomatoes! When I was a kid, our family had a big garden. Each morning, my sister and I would accompany my mother to the garden where we would weed and water the plants. Each evening, my mother served a variety of fresh vegetables for dinner – greens, corn, beans, squash, tomatoes, etc. – the only thing different was the meat. We didn’t realize how lucky we were. Kids being kids, we would have given our right arm for a can of Chef Boyardee spaghetti and meatballs. Trust me when I tell you that I hated early morning gardening. I was sure that as an adult, I’d never weed another hill of beans. Yet, here I am filling the watering can. I don’t look at myself as a health freak but I have to admit pesticides, fertilizers and genetically engineered vegetables worry me. The fact that the companies which supply the foods we eat basically foot the bill for their oversight raises serious concerns. So when I can, I’ve started buying organic fruits and vegetables. Maybe I’m jumping at shadows but erring on the side of caution seems wise. That leads me back to my little garden. And no chemicals makes me happy!